Aftab Ahmed Chowdhury was born 10 November 1985 in Chittagong. He is a Bangladeshi cricketer, and widely judged to be one of their best batsmen. He is a right hand batsman and right arm medium bowler. Aftab Ahmed first came to the attention of the Bangladeshi selectors after scoring 79 against South Africa in the Under-19 World Cup in 2002, and the following year he was pitched into the Test squad to face England, despite having failed to impress in two earlier warm-up matches. His selection was initially viewed with suspicion by the local media, who regarded Aftab as something of a one-day cowboy, and indeed his desire to belt the cover off the ball has resulted in some all-too-brief performances. He made his international debut at the 2004 Champions Trophy, and, despite scoring a thirteen-ball duck was persisted with owing to good performances at Under-19 level for Bangladesh. Find Aftab Ahmed profile and stats of batting, bowling and fielding including latest updated news of Aftab Ahmed, videos and images at Hamariweb.com. 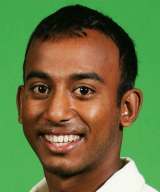 Also find detail Player profile and career statistics of Aftab Ahmed of Bangladesh. Aftab Ahmed - Find Aftab Ahmed of Bangladesh Cricket Team complete player profile, number of matches, runs score, wickets & catches, Statistics, Records, Aftab Ahmed Latest News, Aftab Ahmed Videos, Aftab Ahmed Photos, and other Aftab Ahmed Cricket Team players.